Following Donald Trump’s offensive comments toward Muslims, one elderly patient decided to show her Muslim doctor that she stands in solidarity with him. 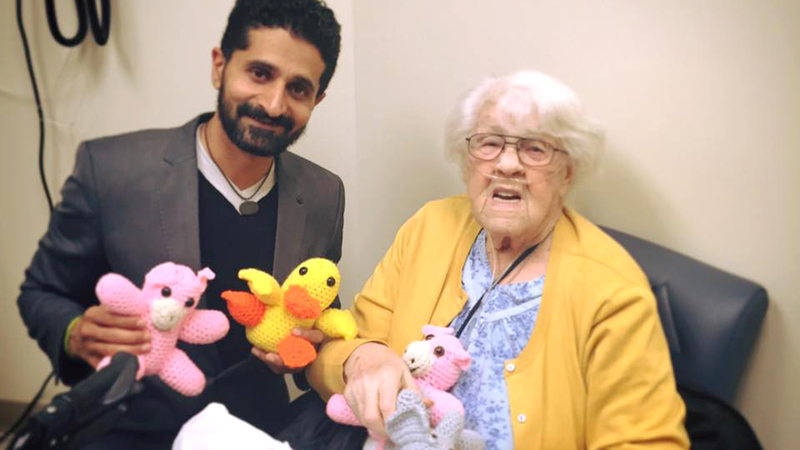 “My 91-year-old patient heard how Trump has been attacking ‘The American Muslim,’ so here she brings me these little stuffed animals that she crocheted herself to cheer me up! And she made my day. The doctor said that the 91-year-old had listened to the radio show and though she didn’t know who Trump is, she felt the presidential candidate’s ideas were hurtful. So when the patient, who happened to have an appointment with the doctor that day, arrived to the office, she gave him the five stuffed animals and offered him some words of support. “She said,’I want this for you because I can feel your pain and what you’re going through,'” he said, recalling the sweet gesture. After Trump attacked Muslims yet again on Monday, calling for a “total and complete shutdown of Muslims entering the United States,” the doctor said that he felt it was time share the picture and show people that though we all come from different walks of life, we can still feel compassion for one another. He says ultimately the photo tells a powerful lesson. “We have to understand that the majority of the people living in this country are like that 91-year-old woman,”. “I’m a first-generation immigrant from Pakistan … she’s from rural Idaho. We have completely separate backgrounds and regardless of that, we relate to each other as human beings.”. Previous Post: A Single Mother Can’t Afford to Buy a Christmas Tree. What Would You Do? This is a beautiful story. We are all Americans and when we try to exclude, we make ourselves less as a result. Kudos to this 91 year old woman. Beautiful share, and yes there are many GOOD Human beings out there who do not share the same views of this very prejudice man who is going to end up making the USA far worse with his own extremist views as tarring all with the same brush… And I am sure the majority of US citizens echo this 91 year old ladies sentiments.. In love and Gratitude for all that you share..
Bless both of them for sharing this story and photos. We are with you. Kindness always proves a point more then war..